Or, more accurately, what they could choose to eat if they happen to attend a Howard County public school. A few months ago at a New Year's Eve gathering I happened to meet Judith Schardt-Shure, who is the cafeteria manager for Burleigh Manor Middle School in Ellicott City. Over the course of the next 30 minutes, Judith proceeded to dispel one myth after another that I held about the HCPSS school lunch program. Other people are noticing our school lunches, too. The Howard County Public School System’s Food & Nutrition Service recently earned an "A+" grade from the Physicians Committee For Responsible Medicine. They also received, for all 73 schools, a HealthierUS Schools Bronze Award, which includes a letter from First Lady (and fitness maven) Michelle Obama. The local media had reported on the two awards, but in a way that added no real information to the press releases. So through Judith I met Mary Klatko, who oversees food and nutrition for all Howard County public schools. We spent a recent morning together at Howard High School photographing lunch choices on offer to the students. Some of those choices are represented here. 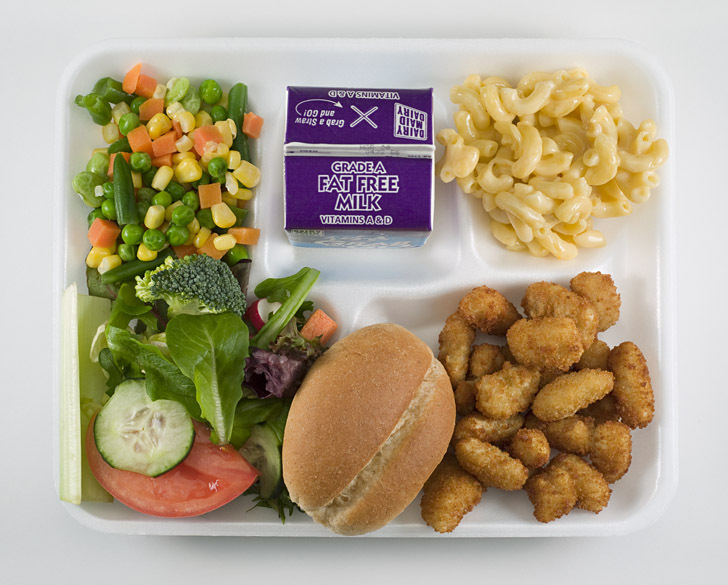 In talking to Mary (along with area field rep Rosalie Edwards and, later, several students) I learned that school lunches in Howard County in 2013 are nothing like those I remember as a high school student in the early 1980s. For one thing, nutrition is a big deal. More so, I suspect, than when I was in school. They count calories, grams of fat (saturated and unsaturated) protein and carbs. Fiber matters, too. Judith noted that not only are whole-grain breads used, but at the middle school level the serving size is upped one day per week to submarine sandwiches to fulfill the weekly fiber goals. Some rolls are now baked onsite, and are noted as such on the menu. You can lead a horse to water but you can't make him drink. Similarly, and as every parent knows, just because nutritious food is on offer doesn't necessarily mean kids will eat it. So nutritional choices are for the HCPSS a balancing act. Which is to say that they try to strike a compromise between the healthiest foods and what will actually make it into kids' mouths. Stealth nutrition is introduced wherever possible. Those fries aren't fried, they're baked. And kids are required to take minimum amounts of fruit and vegetables. Whether they all get eaten is another battle, but the goal is to build healthy habits early. 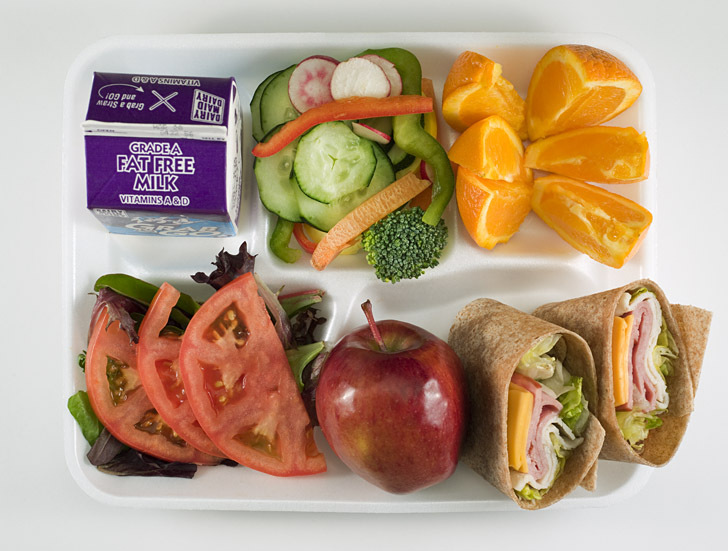 The number of food choices increases as the students progress from elementary age through middle school and into high school. As kids get older, their palettes broaden. 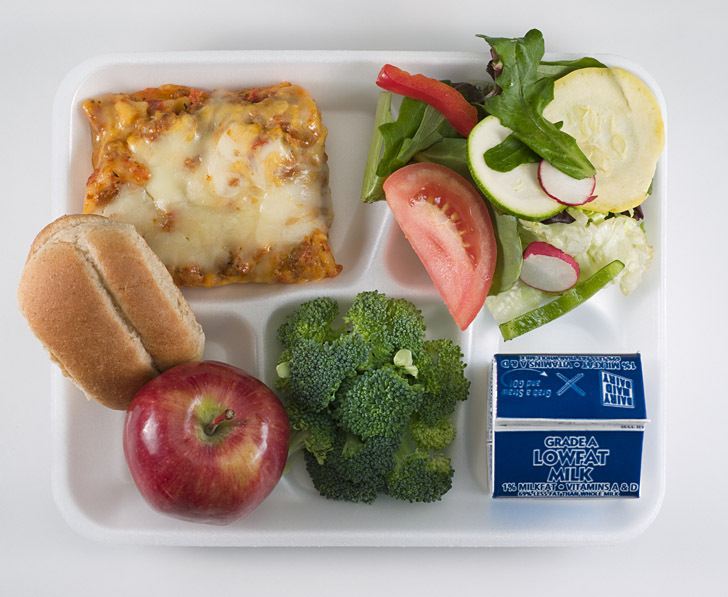 And the school lunch menu expands to take advantage of that and introduce more options. Certainly at the high school level, cafeteria food is getting more upscale. I don't remember shrimp poppers, seen above, being on offer back in 1981. For the older kids salad bars are a big deal, too. You can eat as much salad (with veggies and beans) as you want. This is especially important to high school athletes, who are as a rule more nutrition-conscious and have metabolisms that require more fuel. 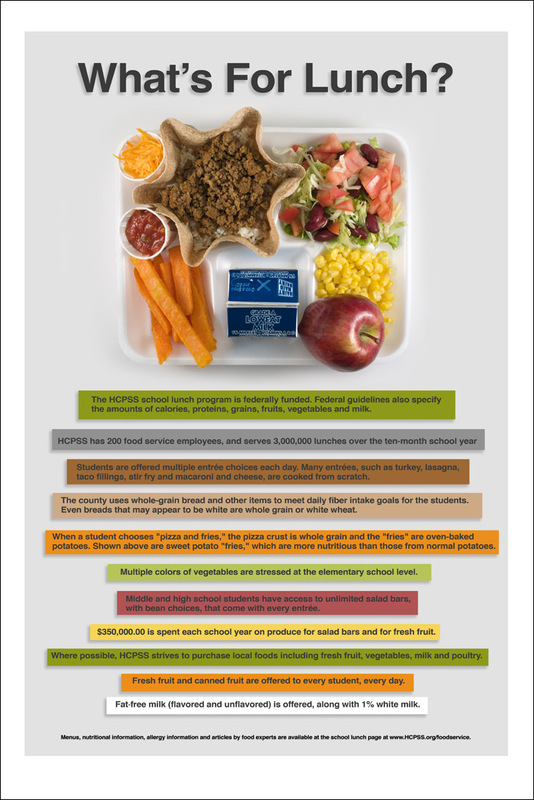 How many school lunches, for example, would you guess are served each year in Howard County? For more information (such as menus, allergy info, nutritional content, fitness and doctor's articles, etc.) 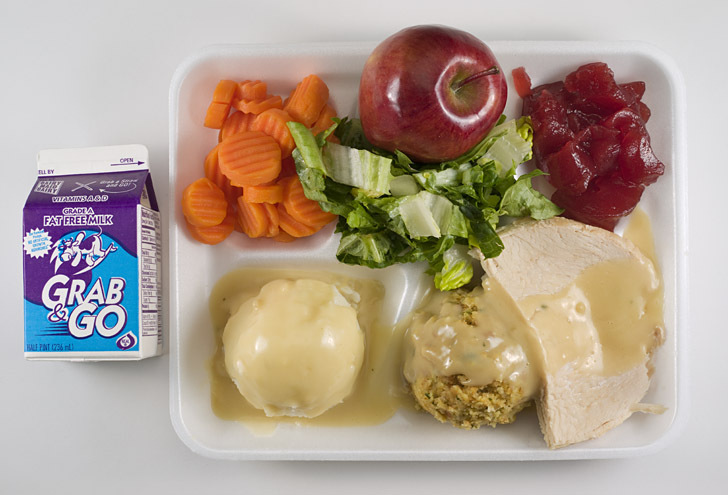 visit the school lunch program's website.